It’s almost 34 degrees and the small karting track that snakes and twists in front of me looks like it’s going to melt. The heat is making my skin itch and the hour-long bus journey from Rio de Janeiro to this strange and slightly rickety old place is not what a majorly jet-lagged brain needs right now. There’s a burly looking policeman guarding the gates to the track and every now and then the sound of human flesh sizzling under a fierce sun is interrupted by the high pitched whine of an electric motor and the squealing of tortured rubber. Perhaps it’s a mirage or maybe the receptors in my brain have boiled but before my eyes, a bizarre looking sports car, skinny track at the front, wider at the rear, giving it the appearance of a motorised arrowhead, pounds the tight circuit with two rather bemused and be-helmeted individuals belted into the rear seats. I’ve travelled to Brazil in order to be strapped into the back of the Bladeglider, an all-electric prototype vehicle that’s highly unlikely to ever grace a Nissan showroom. “Completely and utter pointless”, you may be muttering into your tea but hey, the Caipirinhas here are supposed to be awesome. But let’s be serious for a second. 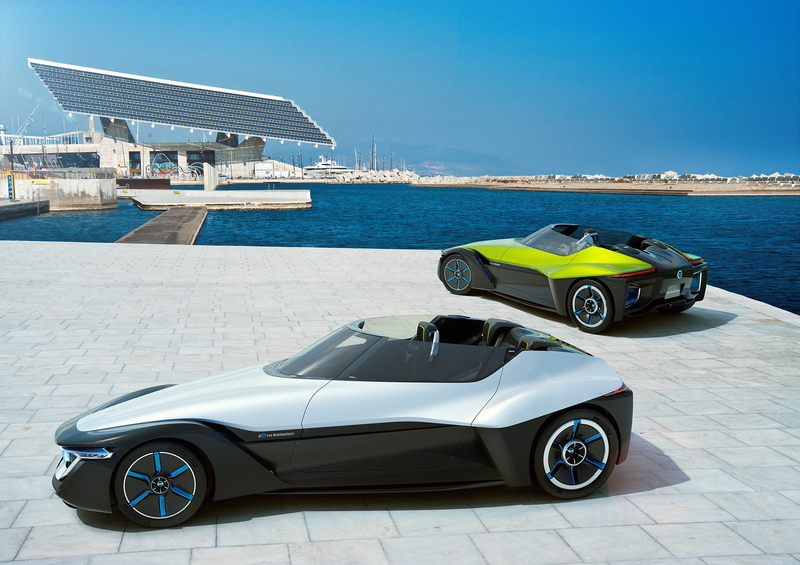 Nissan first unveiled its Bladeglider concept at the Tokyo Auto Show in 2013, with its jaw-dropping styling borrowing elements from the DeltaWing Le Mans racer and futuristic electric powertrain promising equally racy performance without the nasty tailpipe emissions. 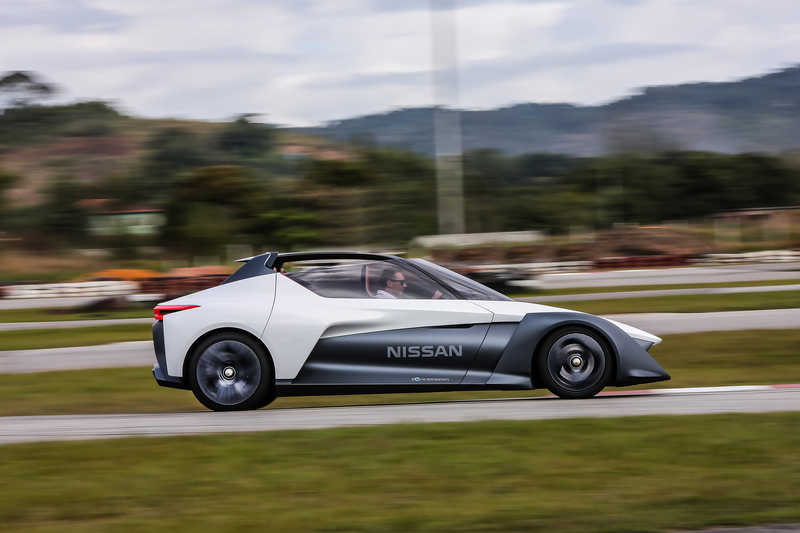 “We wanted to prove that electric cars can be exciting,” explains Gareth Dunsmore, director of EV Nissan Europe, when asked why the company invested so much time and money into a prototype that probably won’t see the light of day. “But the only way to do that is actually build something, to let people experience it for themselves,” he adds. A cynic would have interrupted at this point and suggested that Tesla has been doing such a thing for a few years now but Bladeglider is not trying to poach sales from the all-electric luxury saloon market. It is a bonkers performance machine. If you had to compare it to a conventional car it would be a Caterham rather than a comfortable BMW 5-Series rival. The driver, who sits at the very front of the three flying-v formation seats, is cocooned in a cockpit that appears to have been lifted from a fighter jet. There are three screens surrounding them, the middle most monitor providing power output information and battery charge details, while the two flanking displays replace the wing mirrors with a live video feed from outside. All three occupants are strapped in with a race-spec four-point harness each, while the F1-style steering wheel features a plethora of buttons and dials that control everything from the strength of the regenerative braking to the amount of power delivered to the rear wheels. 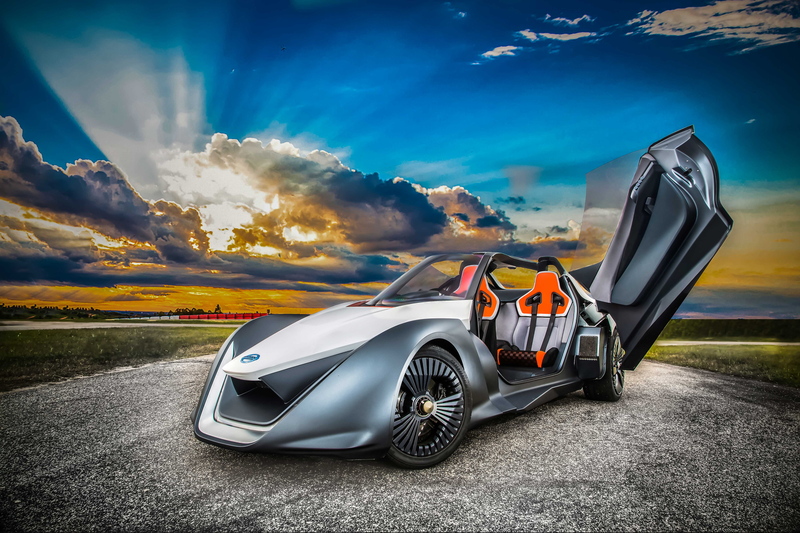 A conventional sports car this most certainly isn’t, because on top of the space age interior, there’s an all-electric powertrain that sees a 220kW lithium-ion battery and two 130kW electric motors (one at each rear wheel) pair up to deliver around 268hp. The angular machine weighs just 1,300kg, meaning the ludicrously instantaneous 707Nm of torque is enough to propel it from 0-62mph in under five seconds. It feels like a true performance machine from the rear seats, with the open-top cockpit allowing all of the sounds, smells and sights to leak into the cabin. The lack of screaming V8 engine also means that every tyre squeak can be heard, while the sound of the wind rushing past my head is both slightly eerie and massively exhilarating. I can only imagine what it’s like to pilot the machine but the skilled helmsman sat in front of me wrestles with the steering wheel every time we exit a corner and occasionally tackles certain sections completely sideways. 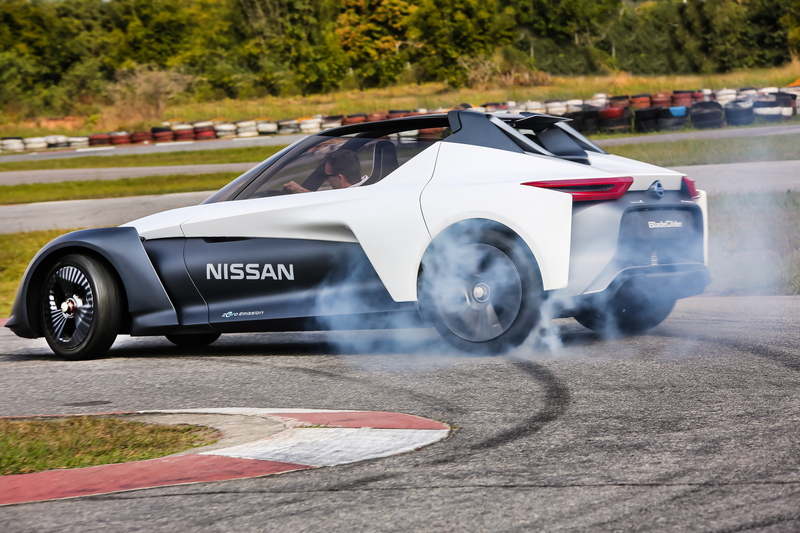 Nissan claims that a race-honed torque vectoring system offers the driver plenty of options when it comes to grip levels. The electric motors can be tweaked to constantly monitor and deliver optimum power for tidy lines or flicked into ‘Drift Mode’ if one feels like acting the hooligan. It comes as no surprise considering Formula E experts Williams Advanced Engineering were drafted in to help with the development of Bladeglider and the UK firm’s experience on the race circuit is palpable. 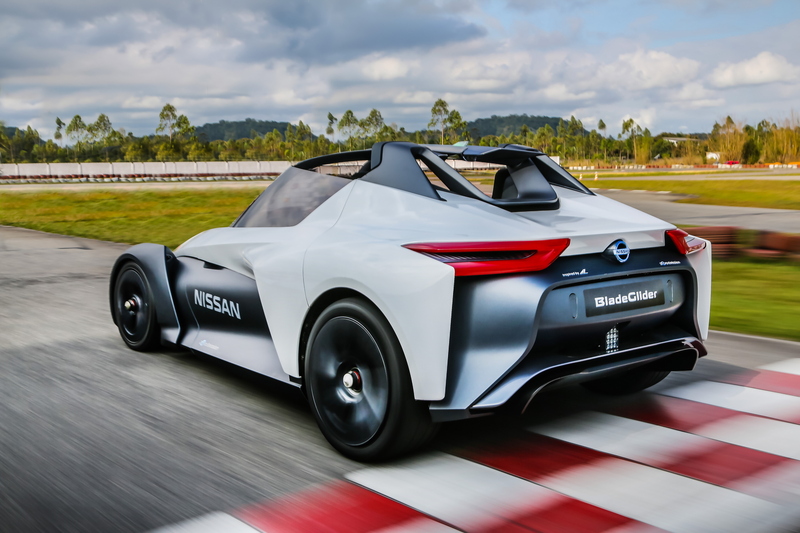 Scintillating stuff then, but Dunsmore and the rest of the Nissan technical staff claim that it is extremely unlikely this thing will ever go into production. And as for the whole “electric cars can be exciting” thing, that’s all well and good when your model line-up actually contains an enthralling EV but Nissan is currently peddling the Leaf and the eNV-200. Both of which lack a certain amount of fizz. 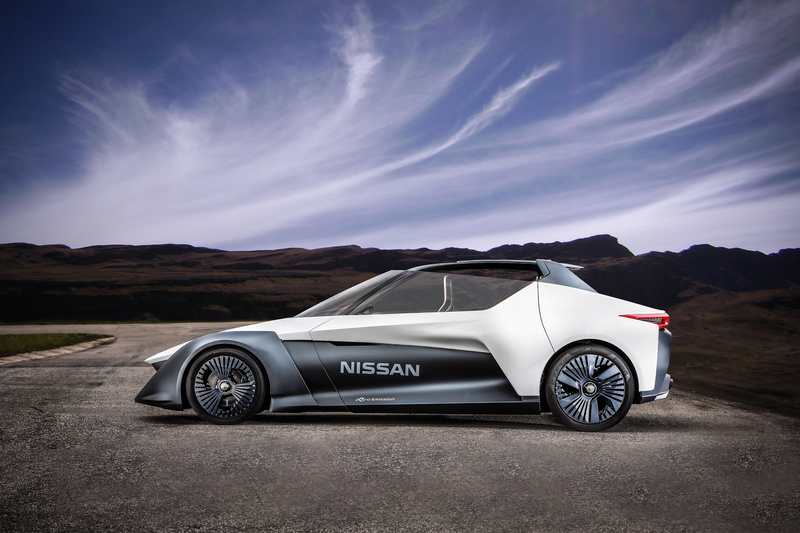 However, Nissan is mapping out a future that sees its internal combustion engines slowly replaced by electric and hybrid vehicles, so let’s just hope that one of those is a bonkers, three-seat sports car that looks a bit like a Dairylea Triangle with wheels.